Very Good condition hardback book in a Very Good condition dustjacket. This is a book of flying stories, but with a difference. 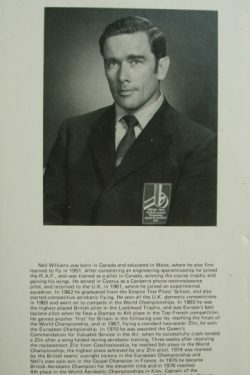 All of these stories are true, covering the experiences of the author as a fighter, test, demonstration, airshow, film, jet charter, and champion aerobatic pilot. The stories include aircraft from the early flying machines to modern military and civil jets. 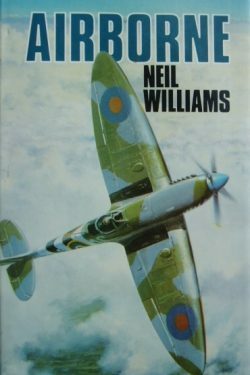 Read of the exultation of first solos in a Spitfire and a Mosquito, the desolation of being lost over the Indian ocean at night short of fuel in a jet bomber, the humour of receiving a parking ticket after a forced landing, the shattering experience of crashing an airplane in front of a crowd of 80,000 people, and the now legendary story of how the author landed his Zlin after a wing folded in flight, which gained him the Queen’s Commendation for Valuable Service in the Air. A wide and exciting variety of aircraft are covered including the Spitfire, Mosquito, Sopwith Pup, Hunter, Scimitar, Meteor, Yak, Heinkel and Falcon. The magic of flight is here to be shared; the tranquility, the excitement, the terror, the humour, and the adventure. 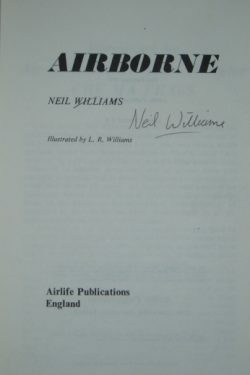 A great book of flying adventures and scarce signed.